An 8-year-old girl is fighting for her life after her father allegedly shot her and killed her mother, her little brother and himself in an explosion of domestic violence at their Miami home, police said. Petty Officer 1st Class John Presnar, 44, allegedly opened fire on his family after getting into an argument with his 39-year-old wife early Sunday, according to the Miami-Dade Police Department. Presnar's mother-in-law witnessed part of the incident before running out of the house to seek help when Presnar pulled a gun, police said. "According to investigators, [Presnar and his wife were involved in a domestic dispute that escalated into a shooting," police said in a statement. "When [Presnar started shooting, his wife told her mother to run out of the house and call for help." The shooting happened about 12:41 a.m. Sunday at the family's home in Miami, police said. After killing his wife, Gretchen Presner, the Coast Guardsman allegedly shot his 7-year-old son to death, police said. When officers arrived at the home, they found Presnar's 8-year-old daughter suffering from a gunshot wound but still alive, officials said. 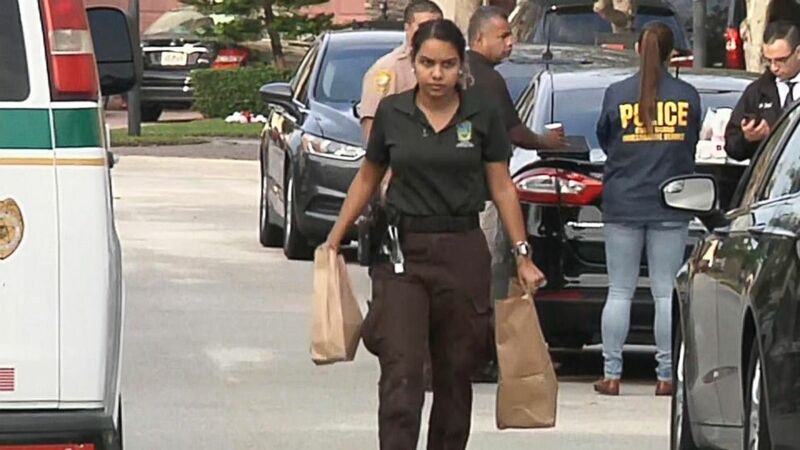 The girl was taken by helicopter to Nicklaus Children's Hospital, where she was in critical condition, police said. Police did not immediately say what the couple was arguing about. John Presnar joined the Coast Guard in 2001 and served as an electronics technician, Lt. Cmdr. Ryan Kelley told ABC affiliate station WPLG-TV in Miami. "The Coast Guard is deeply saddened by this tragedy and our hearts go out to the family members of those who where killed," Kelley said. "We continue to pray and offer the full support of the Coast Guard to the young child fighting for her life."